A new series of aluminium-hulled RIBs, developed by designer Barry Carson and builder Meercat Boats, promises a combination of steady handling, high-speed capability, improved hull form and increased beam, with a customisable approach to boat layout. The Meercat-built RIBs will be available in a range spanning 6.5m to 15m loa – though, Carson adds, if customers require larger models these will be possible. They will be referred to as the Carson 650 through to Carson 1500, with the numbers referring to each model's length (a rendering of the Carson 1350 is pictured, right). Carson is especially keen to match his designs with aluminium hulls, which, he says, “are rugged, and far more able to stand up to wear and tear than composite hulls." From an operational point of view, aluminium hulls are far more robust when it comes to hitting beaches at speed, sometimes required in military operations, for example – an act that could rip the backside out of a composite hull, he adds. The forthcoming RIBs’ proportionally long waterlines, meanwhile, have been developed to boost seakeeping, speed and economy. The new RIBs will offer customers the option of two hull types: a conventional, shock-mitigating Carson deep-V gull-winged chine hull, or one based on Carson’s unique stepped hull design, the latter of which was profiled on the Carson Interceptor range of RIBs that he developed for UK builder Probond Marine. With lengths spanning 7.5-10.5m, the Carson Interceptor craft range incorporated a hull design Carson refers to as ‘Delta steps’: namely, U-shaped steps situated centre-forward and pointing aft. As these steps progress aft towards the centreline, they recede into the hull before they get to the keel line, resulting in a straight keel line. The steps help to significantly increase aeration from the chine to half-way down to the keel, resulting in reduced friction and drag, yet maintaining good water flow along the centre sections for directional stability and control. This type of step also makes it easier to launch the Carson Delta-stepped hulls from trailers, beaches and shallow-water environments. The reduced centreline aeration also makes it relatively easy to incorporate waterjets aboard this RIB type, which are usually off limits to boats incorporating stepped hulls. Some adjustments have been made to this hull form. “The Interceptor incorporated a vertical stem design,” Carson explains. “Some users told us that when performing bow-on operations – such as pulling up alongside other ships, pushing other vessels, etc – the vertical stem could cause damage or the potential for damage to their own boats or others.” Subsequently, the Meercat-built RIB stem profiles will be slightly raked forward, with increased forward overhang to effectively protect the hull’s stem. As well as shielding the RIB from damage, this modification should result in less of a “battering ram effect” on other vessels and/or structures.The RIB’s bow, Carson explains, will resemble more of a “chin-shaped” form which will interface with other vessels, “with only the tube making contact” with the target vessel. Additionally, this forward overhang can reduce spray and enhance the vessel’s operational capability in harsh weather and deep-water environments. Other modifications for the forthcoming RIBs include increased beam – albeit retaining the same amount of hull within the water when planing, to avoid unnecessary drag. This additional beam increases stability, deck space and payload - the latter creating greater fuel capacity, thus potentially extending range to almost 2,000 miles, as well as horsepower capacity for speeds in excess of 65knots. 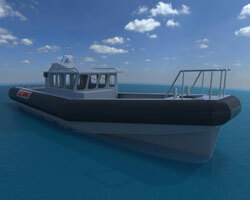 The new RIBs can also be ordered with fully enclosed wheelhouses and elevated helm positions on a flying bridge. Carson adds: "Each boat will be virtually custom-designed and built to suit individual customer needs and with the option for a diesel inboard engine, with either Z-drives, surface drives or jets, or outboard engines."